Car Hire San Francisco Airport is a part of an international hire broker VIP Cars and, thus, has friendly tie-ups with a leading network of suppliers in San Francisco. We present some of the best Napa Valley car hire deals at most competitive prices. When you rent a car at Napa Valley you get the convenience of planning your stay as per your schedule. Both business and leisure travelers can find a suitable hire car with us, as our suppliers provide us with finest fleet of economical and high ends cars. With exclusive discounts, top hire inclusions, easy online booking and 24/7 booking support, we make your car hire experience unforgettable. Napa Valley is located in the Bay Area in California which is also the main wine growing region of the United States of America. It is also one of the major wine regions of the world. You should take up Napa Valley car hire deal to visit this place known for its gourmet restaurants, spa-treatment centers and cafes. The Napa Valley Wine Train is an amazing ride for sure. 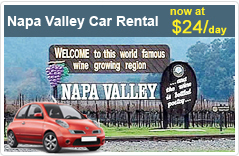 You can reach the train station through Napa Valley car rental service. Bathe in the hot springs is another activity of love. You should also have a mud bath in Calistoga. With Napa Valley car hire deal tourists can also visit the Bonaventura Balloon Company.